Summary: When your Windows Update stops working, try a few simple troubleshooting steps before calling Microsoft (which you can also do). The error message also included 11 steps to "make sure these services [were] running." I followed the instructions and restarted the services just in case. It did not help. Then I noticed the Microsoft Online Assisted Support (no-cost for Windows Update issues) link, which took me to the page showing an option to Contact a Support Professional by Email, Online, or Phone. I signed in and submitted a support request. To my surprise, within 24 hours, I got a response with detailed troubleshooting instructions. After completing the first step, Windows Update started to work. Here are the instruction in case someone encounters the same problem. and click OK (notice that there is a space between regsvr32 and atl.dll). While registering each DLL file you should get the "succeeded" message. If you encounter any error message, you probably need to contact Microsoft. If the issue persists, move on to step 2. Click on the Log On tab and make sure that the Local System account option is selected and the Allow service to interact with desktop option is unchecked. Check if this service has been enabled in the listed Hardware Profile; if not, click the Enable button to enable it. Click on the General tab; make sure that the Startup Type is set to Automatic. Click the Stop button under Service Status to stop the service. Click the Start button under Service Status to start the service. The Event Log service is enabled on all of the hardware profiles. This service does not have an option to enable or disable on certain hardware profiles. If the previous steps still do not help, proceed to step 3. One possible cause is that the temporary folder for Windows Update contains corrupted files. Let's erase all the files there to get the system clean. In the opened folder, rename the folder SoftwareDistribution to Sdold. If at this point Windows Update still does not work, you will probably need request support from Microsoft, but before you do, if you are technical enough, you may want to see if the WindowsUpdate.log file contains any suspicious errors. To open this log file in default text editor, enter its name in the Start-Run menu. Summary: Steve Yegge explains the importance of branding at Open Source Convention 2007. And he ain't got no PowerPoint! Imagine yourself invited to speak at a technical conference. You do your homework: pick a topic, build the slides, bring a laptop. You are ready to go, but once you get on stage, you realize that the projector does not work and tech support guys can't fix it. What do you do? As Steve Yegge showed at OSCON 2007, you do not need PowerPoint to give an interesting speech. Sure, a couple of slides would be helpful, but they were not essential. If you want to hear Steve's perspective on the importance of branding (branding is not only relevant to major corporate brands, such as Coca-Cola, but equally applies to the work of your development team), or if you are interested in learning how other corporations handle justifiably bad brand perceptions (so that you know what to expect on the next screw-up), watch this 25-minute video (if the link does not work, try this one). As an introduction, you can also read Steve's How To Make a Funny Talk Title Without Using The Word "Weasel" post. Wait wait... fix this podcast! 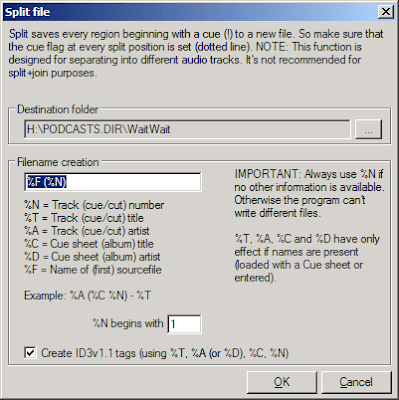 Summary: See how you can fix unplayable or corrupted podcast files; learn how to split long podcasts into shorter segments. Every Sunday, a local NPR station plays my favorite show Wait Wait... Don't Tell Me!. Because the 11:00 AM-12:00 PM broadcast time is rather inconvenient (for me), I subscribed to the show's podcasts. The podcasts play fine on computer, but my MP3 player cannot handle them: after playing several seconds of introduction, the player pauses briefly, then makes a loud screeching noise and moves to the next track. I tried these podcasts on other MP3 players with no luck (although the same players play podcasts of other shows just fine). After several weeks of troubleshooting, I finally determined the root cause of the problem: apparently, the MP3 player does not know how to handle a short (less than 2 seconds) silence gap that follows the introduction, so it jumps to the next track. Eventually, I figured out how to make podcasts playable on my MP3 player and more manageable. These are the steps I follow. If you like a particular show, instead of looking for new podcasts yourself, you can get them via an RSS (or Atom) feed. If you computer is always turned on, you can use a desktop-based aggregator, such as Juice. The aggregator will check if any new podcasts are available for your subscriptions and download them automatically. Alternatively, you can use an online aggregator, such as Bloglines, which will monitor your subscripions and display new podcasts when they become available. 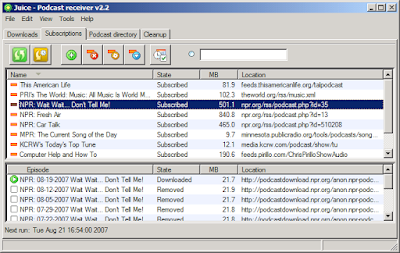 An online aggregator allows you to access podcast feeds from any computer, but you will need to download MP3 files yourself. 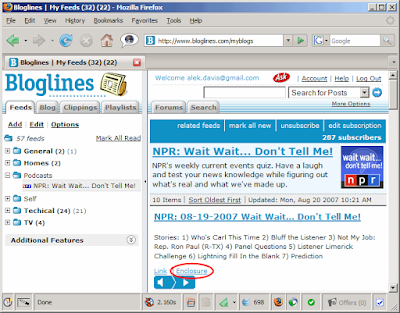 When using Bloglines, click the Enclosure link to download the podcast (MP3) file. To subscribe to a podcast show, you need to know the address of the podcast feed, which should be listed among the subscription links. For example, NPR provides a directory of available podcasts, where you can find links to such shows as NPR: Wait Wait... Don't Tell Me (http://www.npr.org/rss/podcast.php?id=35), NPR: Car Talk (http://www.npr.org/rss/podcast.php?id=510208), and others. Select the Edit - Preferences menu option. In the Audacity Preferences dialog box, select the File Formats option from the list box on the left side. 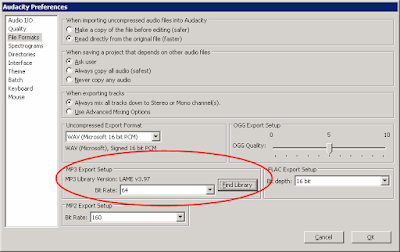 In the MP3 Export Setup section, use the Find Library button to locate the lame_enc.dll file (this file must be in the same directory where you installed LAME, such as C:\Program Files\Lame). Make sure that the Bit Rate value in the MP3 Export Setup section is set to 64; a larger value (such as 128) will increase the size of the modified podcast files. Notice that while the 64 bit rate is good enough for podcasts, it is insufficient for music files; when using Audacity for music editing, increase the bit rate value to at least 128. Click OK, to close the Audacity Preferences dialog box. 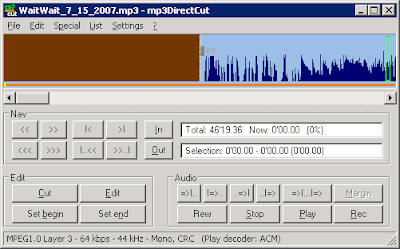 Open the podcast using the File - Open menu or by dragging and dropping the MP3 file onto the Audacity window (Audacity may take a minute or longer to open the file). After loading the podcast file, press CTRL+A keys to select the whole track. Select the Effect - Truncate Silence menu option. In the Truncate Silence dialog box, set the value of the Max Silent Duration (milliseconds) to 250 (you can use a slightly larger or smaller number) and click OK (truncating silence takes about one minute). If you find the volume of the podcast too low, you can increase it by selecting the Effect - Amplify menu option. 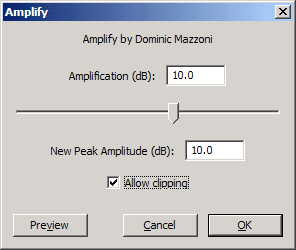 Set the amplification level to the appropriate settings (use the Preview option if needed), check the Allow clipping box, and click OK (normally, you should avoid clipping in music files, but you will probably not notice its effects in podcasts). Amplification takes a couple of minutes. Once the track is ready, use the File - Export As - MP3 menu option to save the modified file. If you want, you can rename the file in the Save As dialog box or you can use the same name (I prefer to use the name of the show and the date of the broadcast in the file names, such as WaitWait_7_15_2007.mp3). Exporting to an MP3 file takes a few minutes. At this point you will have an MP3 file which your MP3 player should be able to play. However, there is one additional step I recommend. Open the podcast using the File - Open menu or by dragging and dropping the MP3 file onto the mp3DirectCut window. Select the Special - Auto Cue menu option. In the Auto Cue dialog box, define the length of the segments into which you want to split the podcast (10 minutes is a reasonable value) and click OK. Select the File - Save Split menu option. In the Split file dialog box, define the format of the names of the generated track files in the Filename creation field. I use the %F (%N) format to append sequence numbers to the original file name, but you can use a different naming convention. You may also want to change the destination folder where the files will be saved, e.g. directly to your MP3 player. Click OK to start splitting the file (splitting takes about one minute). I realize that the process may seem a bit tedious, so if you have recommendations how to improve or simplify it, please submit them via comments.